Fans of virtually every team in the country dislike the Michigan Wolverines, and could probably come up with 25 reasons why with little trouble. However, as a Michigan State Spartans fan, I believe that I am closer to the Wolverines than most, and can give an accurate description of the 25 reasons they should be hated the most. 25. Hoke-mania. The Chris Christie imposter only has one year of experience at Michigan under his belt and people are already talking about him like he's the second coming of Bo Schembechler. Hoke isn't even the best coach in the Legends division in the Big Ten. 24. The Color Maize. Give it a rest, Michigan, your colors are blue and yellow. Sun-bright, eyeball-burning yellow. You can't just make up a new color so it sounds more impressive. Such a Michigan move. 23. Downtown Ann Arbor. The city where the University of Michigan sits is not bad, but it just does not compare to the culture and nightlife of nearby East Lansing. 22. The Way Rich Rod Was Treated. Poor Rich Rodriguez was stormed out of town with flaming pitchforks. Personally, I thought he did a great job and did not deserve the general hostility, let alone the firing. 21. School Greed. In the never-ending quest to make the most money possible, the Big House was expanded in 2008, and only after being sued by a group of disabled veterans did the university scale back the expansion to remain handicap-friendly. 20. Excuses. I've never heard a Michigan fan just admit the Wolverines aren't the better team. It seems like all of the team's past losses are the fault of either poor officiating or Rich Rod. 19. "Ohio." Trying to look cool by not trying, Michigan fans have an annoying habit of calling Ohio State just "Ohio" -- as if refusing to acknowledge that the real name is "Ohio State" is some kind of insult. Or maybe these fans are trying to block out the bad results against other "State" teams. 18. Rulebreaking. In 2010, the NCAA found that Michigan committed multiple "major" rule violations involving failing to monitor the program, having impermissible practices, and lying to investigators. In May of 2012, Michigan players got into the act sending illegal tweets. 17. Lack of Accountability. Despite the laundry list of rules violations, the Wolverines were never hit with a bowl ban or any of the serious sanctions that were imposed on their rival Buckeyes. 16. Greg Robinson. Robinson arguably single-handedly cursed the once-vaunted Syracuse football program. Naturally, Michigan rewarded him by handing him the keys to the defense as the defensive coordinator. Michigan's defense abruptly got destroyed. Shock ensues. 15. Those People With No Connection to the School Who Love It. Much as there are fans of the Yankees, Lakers, and Cowboys all across the country, people love Michigan. These fans are always the first to defend the team and be decked out in maize/yellow and blue. But when it comes down to it, none of them can really describe why they even like the team. 14. Embarrassing the Big Ten Conference. Appalachian State, anyone? 13. The Big House. The only thing I dislike more than Michigan fans is the thought of sharing three hours with over 109,000 of them at the same time. 12. Desmond Howard. Former Michigan player and current television analyst. As annoyingly cocky as he was as a player, he is even more annoying now. We get it, Desmond, you went to Michigan. You don't even have to explain when you pick it to win every week. 11. Uniforms. It's unfathomable why a school with the tradition of Michigan would steal its uniform design from the Delaware Fighting Blue Hens. 10. Denard Robinson. If he was the quarterback for any other team in the country, it would be acknowledged that he struggles to throw the ball even average distances downfield. Instead, he is a perennial Heisman candidate. 9. Overrated-ness. Speaking of being overrated, it generally describes the entire team. Writers always talk themselves into Michigan being good until it begins to blow it. Unfortunately, last year, the BCS bought into the false hype and awarded Michigan a Sugar Bowl bid -- even though the Wolverines weren't even good enough to win their division in the Big Ten. 8. Alumni. Show me a humble U of M alum and I will show you a liar. 7. Loose Shoes. Everyone hates the feeling of walking when your shoes are too loose, especially when the laces fall out. It is very uncomfortable to have them almost slipping off with every step. 6. Mike Hart. Although I would like to thank him for inspiring a class of Spartans, Mr. Hart wrote a check that future generations of Wolverines football players have not been able to cash. 5. Tom Brady. Fitting that one of the most annoying NFL players came from Michigan. Perhaps that is where he learned his style. 4. Banner Jump. Some teams are led out by charging animals or fierce mascots. Michigan players leap up and barely scrape the bottom of a banner that says they are supported. This is easily the least intimidating entrance in the nation. 3. The Fight Song. Everything about "Hail to the Victors" is annoying. And, how does it work when the Wolverines lose? Is their band saluting the other team as victors? If so, the Spartans have been hailed quite frequently as of late. 2. The Obsession with a "Michigan Man." For some reason, Michigan fans are obsessed with having a coach who was somehow connected to the school in the past, a so-called "Michigan Man." Don't worry, no one else wants the job anyways. 1. Fan Base's Unjustifiably Inflated Self-Importance. This is pretty much the above 24 items all rolled into one kind of fan. Del Pearson attended Michigan State University College of Law and has been a season ticket holder for MSU football since 2008. Follow Del on Twitter @DelPearson2. Those were the factors we weighed in our conference-by-conference rankings, and that continues in our national rankings. We also examined each coach’s success in the regular season and the postseason. In many cases, we took into account what the coach has done with his current program in addition to previous stops in his career. In addition to a coach’s track record, we asked ourselves: Which coaches would their peers prefer not to face. We’re also keeping an eye on the future. In short, can we expect these coaches to continue to produce similar or better results over the next five seasons or so? All those factors led us to name Michigan State’s Tom Izzo the top coach in the country, as the best mix of all the aforementioned characteristics of a college basketball coach -- sustained success during the regular season against a high level of competition, advancing in the NCAA Tournament, recruiting players to fit his system, ability to teach and develop his roster. Although the NBA has been interested in Izzo, it’s tough to imagine him coaching anywhere else. Izzo has his system at Michigan State down to a science. While we can’t say Michigan State overachieves -- the Spartans get their share of McDonald’s All-Americans and sends players to the NBA -- Izzo has a way of getting the most from his players. Only two Spartans have declared early for the NBA Draft in the last decade and none since 2006. Michigan State has continued a run of 15 consecutive NCAA Tournaments despite producing only one lottery pick since 2001 and no first round picks since 2006. Mike Krzyzewski and Roy Williams are the only active coaches with more trips to the Final Four than Izzo’s five. In 2011-12, Krzyzewski continued to add to his long list of achievements, surpassing mentor Bob Knight’s record of 902 Division I wins. The 65-year-old remains one of the game’s elite coaches despite changing times: He is 152-30 over the last five seasons, including 63-17 in the ACC. In the NCAA Tournament, he’s proven he can still win titles, as Duke did in 2011. Meanwhile, he continues to be the coach a handful of fans like to watch lose, as Duke did to 15th-seeded Lehigh in the 2012 Tournament. As always, Krzyzewski will continue to win his share of games. He remains in striking distance of the men’s collegiate wins record, held by Philadelphia University’s Herb Magee (941 wins and counting) and the all-time collegiate record, held by Tennessee’s Pat Summitt (1,098). Kentucky and John Calipari was the perfect marriage even before the 2012 national championship. Before then, the question was if Calipari would win a title at Kentucky with cycling through a roster of one-and-done players. With a team featuring six NBA draft picks, including the top two selections, Calipari answered. Now, the question seems to be how many titles Calipari could win at Kentucky -- provided he doesn’t dip is toe into the NBA again. Senior Night may be a bygone tradition for Calipari teams, but he’s suffered minimal drop-off from year to year. His 173 wins over the last five seasons at Kentucky and Memphis are more than any other coach in the country. Kansas’ Bill Self is No. 2 at 154. I always like to check the two-deep for youth, but this year, I found myself first counting the number of senior starters when the Spartans released the first depth chart of fall camp. 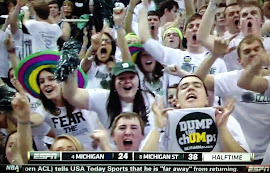 After two 11 win seasons, it seems chUMps assume the cupboard is now dry at MSU. 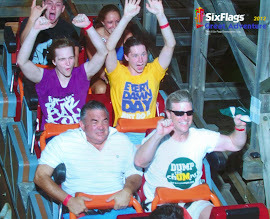 I check out reader comments whenever I get a chance to catch up on Spartan articles on the web (see headline links at the bottom of this blog page) and they are so focused on the loss of Cousins and our receiving corps that many chUMps have literally written us off as having our two years of fun and now things are "back to normal". They couldn't be further from the truth. To see some historical build-up to this on-going improvement check out this post (and prediction) from post game Big Ten Championship reflections and this post from The Only Colors Blog - posted on the Freep.com today. Just a side note, unofficially, MSU Football is over 160 days without a single off field incident while chUMps have had 7 players charged with a crime in the last 6 months. That is about 8% of the scholarship "student-athletes" on the football team... Like I said, a Spartan will do something dUMb in the coming weeks or months - maybe a few, but the perception that chUMps throw out there on the Internet and at water coolers about the MSU program vs chUMpmart being like thugs vs super-heroes is, well... the facts just say it all. That Alabama game keeps looking better and better. Again, I want to emphasize that I am not saying Spartans don't and won't get into trouble. It is just important that every knows that the snow does get yellow in Ann Arbor (especially near the feet of the hockey coach). Posted: Mon, Jul 23, 2012 : 4:30 p.m.
Michigan tailback Fitz Toussaint ran for more than 1,000 yards last year as a sophomore. He was arrested over the weekend on a drunken driving charge. Michigan's Frank Clark celebrates an interception in last season's Sugar Bowl. The sophomore currently is suspended while he faces a home invasion charge. The Michigan football team's legal problems continue. Just hours after announcing starting tailback Fitz Toussaint is indefinitely suspended following a drunken-driving arrest, the Wolverines revealed Monday that defensive end Frank Clark also has been suspended. Clark is facing a charge of second-degree home invasion, a felony punishable by imprisonment for not more than 15 years or a fine of not more than $3,000 -- or both. He is accused of stealing a MacBook Air from Stockwell Hall on June 14 -- his 19th birthday -- and is scheduled for a preliminary examination in Washtenaw County's 14A District Court Aug. 2. "We are aware of the case regarding football student-athlete Frank Clark," coach Brady Hoke said in a statement. "This is a serious accusation and we will follow the lead of the judicial system. "Frank was and will continue to be suspended pending the outcome of the investigation." Clark is battling sophomore Brennen Beyer for the starting spot at weak-side defensive end, after senior Craig Roh moved from the weak- to strong-side. His status for the blockbuster season opener against defending national champ Alabama, like Toussaint's, is uncertain. Clark didn't play much early as a freshman last year, but became a regular part of the rotation by the end of the season. He played well when thrust into action in the Sugar Bowl, including coming up with an athletic interception that led to one of Michigan's two touchdowns. Clark appeared in 12 games as a true freshman and finished with 10 tackles. University police responded to a complaint from a 19-year-old resident of Stockwell Hall, located at 324 South Observatory St., that a laptop had been stolen from his room between 10:50 a.m. and 5:40 p.m. on June 14, said Diane Brown, spokeswoman for U-M Department of Public Safety. Clark is also a resident at Stockwell Hall. "The resident reported that when he came back to his room, the door was propped open in a different way than he had left it, and his laptop was missing," Brown said. The computer's estimated value is $1,800, according to officials. A police investigation, assisted by computer experts, tracked the computer to Clark, who was arrested June 19 and arraigned on one charge of second-degree home invasion the next day. His preliminary examination has been postponed twice. If probable cause is found at the exam, the felony case will be bound over to the Washtenaw County Trial Court. Clark remains free on a $15,000 personal recognizance bond. We have 15 months to get the word (phrase) out so our plan with the student section can be most successful when chUMps visit Spartan Stadium next year (see vision statement at top of page). How can you help? 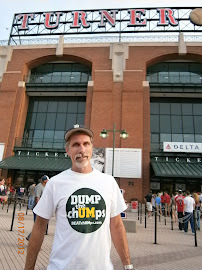 ~Wear your DUMP the chUMps shirts to all high population locations - from malls, to concerts to little league games. ($5.00 special offer - details below). ~Share each post on Facebook, Twitter or via email (tool at the top of each page). ~Follow us on Twitter (top right of blog) and Retweet as your receive each post headline link or tweet. ~"Like" the blog (top of blog page). ~Follow our Fan Page on Facebook (right column). ~Use the resource center at the bottom of the page to find your Spartan headlines across the web daily. ~Become a guest author on the blog (email BEATchUMps@gmail.com). 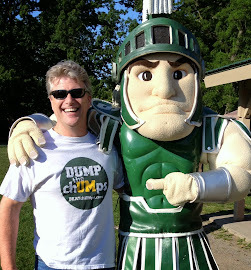 ~Comment on Spartans news articles and forums on the web using the the word "chUMps" and phrase "DUMP the chUMps" and always refer readers to BEATchUMps.com or @DUMPthechUMps on Twitter. ~Be a respectful Spartan and use the phrase in fun - not the hate/bitterness you read out there. Don't be a chump while poking fun at chUMps. ~If you are a parent of a student at MSU, it will take them a while to understand, but it is important that they get involved and help in exchange for the privilege of being a Spartan. It is a responsibility they must accept. ~Have fun with people who comment on your shirt and share BEATchUMps.com with them. 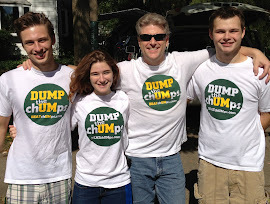 The shirts: Note the new design only has the UM in yellow, giving the shirt a more Green and White look which emphasizes the entire phrase over just the DUMP UM part. It's a little easier for those outside the rivalry (and those on the other side of the rivalry) to chuckle at it. BEATchUMPs isn't profiting on the shirts. They cost about $5.00 per shirt to produce and when I can hand one to you that's all I ask. On Ebay, they are $10 to cover extra costs/commissions and shipping. Send me an email to BEATchUMps@gmail.com to work out a direct ship for quantity savings. XXL and XXXL are extra. Mark Dantonio has elevated Michigan State to one of the top programs in the Big Ten. When Andrew Maxwell arrived in East Lansing in the late summer of 2009, he could have easily kept his mouth shut, endured his redshirt season and spent the next two years toiling anonymously in the shadow of all-time Michigan State wins leader Kirk Cousins. No one would have blamed the backup quarterback for taking the quiet route for three years before blossoming in 2012. Maxwell wasn’t looking for anything like that. Instead of dutifully playing the freshman role, he went about the business of constructing relationships with players — even upperclassmen — in preparation for the day he would take over for Cousins. That’s not cockiness, but rather a sound leadership strategy by a young man who stands ready to run the Spartan offense and become the face of a program that has made a U-turn from its old image. “When I got on campus, I started leading right away by building bridges with teammates,” Maxwell says. “That way, when it became time to be the starter, it would be easier to lead. Maxwell may be the same out-front guy he was when he came to school, but the Michigan State program has transformed itself dramatically over the past couple seasons. Two straight 11-win seasons and a pair of New Year’s Day bowl games — including a win over Georgia in last year’s Outback Bowl — have put the Spartans in position to assume a role of influence and status in the Big Ten. Over the past four seasons, MSU has won more conference games than all but one other school (Ohio State) in the league, has beaten Michigan four straight times and has, most important, shed the reputation as the program that could always be counted on to make a key gaffe or have an off-field issue at the wrong time. That started changing in 2007 when Mark Dantonio took over as head coach. Though low-key in his demeanor and mannerisms, Dantonio is a rock-solid leader who values character above everything else. During a March interview, he spoke of the 150 straight days the program had enjoyed without an off-field incident. While that could change in the heartbeat of a 19-year-old, it demonstrated the standard he had established, and more importantly enforced, within the program. By recruiting players who can thrive on the field and lead off it, Dantonio and his staff have created a new ethos at MSU. In 2009, the Spartans were 6–7 and dropped an Alamo Bowl decision to Texas Tech. The enemy wasn’t necessarily youth, although it was a younger team; it was the lack of a strong example from the team’s upperclassmen. Although three of them were voted captains, the fourth captain was Cousins, then a sophomore, who was only the second Spartan sophomore ever to receive that distinction. The younger players who ended up being the cornerstones of the success of the last two seasons didn’t click with their elders, most of whom had been recruited by previous MSU coach John L. Smith. “We didn’t have good chemistry that year,” defensive coordinator Pat Narduzzi admits. That has not been the problem the past two seasons, and it’s unwise to discount the value of such chemistry. Successful teams feature leaders who take direction from the coaches and hold their peers accountable. That may not have been lacking completely before in East Lansing, but it is in evidence now. Twenty-two wins in two seasons provide the proof. There are four games scheduled on Aug. 31 involving FBS teams, but the one expected to attract the most attention is Boise State’s visit to MSU. Although the Spartans also play Michigan, Ohio State, Wisconsin, Nebraska and Notre Dame, the matchup with the Broncos will allow Michigan State to take the national stage and deliver something that will gain attention. “If we want to go where we want to go, we have to make a statement in the Boise State game,” Dantonio says. It’s interesting that a Big Ten team would consider a game with a Mountain West opponent (BSU moves to the Big East in 2013) as a yardstick for its program, but the Spartans feel as if this is their time to take some steps outside the neighborhood. AD Mark Hollis has inked agreements with Boise State, Alabama, West Virginia, Oregon and Miami, giving the Spartans a fortified schedule and allowing them to reach out to constituencies beyond the state of Michigan. There is little chance Dantonio and his staff will be recruiting heavily in Idaho and the Pacific Northwest, but this is an opportunity for a program that has been in the shadow of Big Ten rivals to extend its sphere of influence — as the highly successful Spartan hoops team has done. 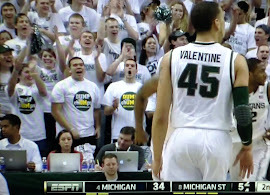 College athletics are filled with relationships like the one that has prevailed between the Wolverines and Spartans. Alabama considers itself superior to Auburn. Texas makes Aggie jokes at the expense of Texas A&M. University of Washington is the cosmopolitan school, and Washington State is the farm. You can still find bumper stickers in Ann Arbor referring to Michigan State as “Moo U,” a nod to the school’s agricultural roots. And for all the references to the “Arrogant Asses” at U-M, a designation coined by former Spartan coach Darryl Rogers, there remains something of an air of superiority amidst the Wolverines. But ever since former Michigan running back Mike Hart referred to MSU as the “little brother,” there has been a change going on. The four-game winning streak has fueled it, yes, but the attitude in East Lansing has changed, too. Dantonio has made no secret of his dislike for Michigan, and last winter, MSU hoops coach Tom Izzo weighed in, too. The Spartans aren’t behaving like aggrieved smaller siblings, but rather like newly pumped-up equals who aren’t having any more of the condescension. That can’t be enough for Michigan State. Winning in the sandbox is good. Taking it to the rest of the playground is better. The Spartans have more character than in recent years, and they have been able to back it up with what Dantonio and his staff consider some good recruiting classes. Dantonio was able to redshirt all but two of last year’s newcomers and expects many of them to contribute next year, particularly on defense. As Maxwell assumes the starting quarterback role for Cousins, who amassed several records, he is something of a symbol for MSU’s future. If Maxwell steps in and delivers, the Spartans will likely continue their prosperity. All that’s missing from the offense is a proven wideout. Michigan State fans have waited a long time for the kind of sustained success that the team seems to be on the verge of achieving. Some say the next chapter begins Aug. 31 against Boise State. Those who know realize it started more than five years ago, when Dantonio arrived on campus. The story continues this fall, and Spartan fans are hoping that each turn of the page brings something wonderful — and new. This article appears in Athlon's 2012 Big Ten Preview Annual. While some say, "wake me up when the season starts", part of the fun is the anticipation and guess-work while the boys are working out of the spotlight to make themselves better. Joe Rexrode posted a summary of this year's nation award watch lists for college football. It sure looks encouraging for Big Green and I find the reader comments fascinating. I included a few of them for you. Is this really happening? Is MSU really becoming a sustained conference power? Is it already there? Greetings and salutations. Vacation is over. Olympics and football are coming. And “watch lists” are already upon us, combining with preseason mags to tease us until something actually happens on a football field. Two of the most significant awards — the Butkus and Lombardi — put out watch lists today, and Denicos Allen is on both of them. So is Max Bullough, joining Allen on the Butkus (top linebacker) list and joining Allen, Will Gholston, Chris McDonald and Marcus Rush on the Lombardi (top lineman, offense or defense) list. It’s not as surprising to me that Bullough was named, simply because he has received more publicity and was the middle linebacker last season for one of the top defenses in the nation. Allen’s 2011 production as one of MSU’s surprise players (led team with 18 1/2 tackles for loss and 11 sacks) says he should get this kind of preseason recognition, but that isn’t always enough. Now he’s getting the attention — though he split on the top defensive player award, named by the Bednarik people but snubbed by the Nagurski people. He’s also likely to get more attention from opposing offensive coaches this season, a concern expressed a few weeks ago by Pat Narduzzi. “You know, Greg Jones got a lot of sacks his junior year and then as a senior got two or three,” Narduzzi said. “People are gonna block (Allen), they’re gonna know where he is. The other people, they coach too. People have answers for your stuff, so you’ve got to counter with answers. * Ticket update: MSU has sold out its student season tickets and has less than 100 singles remaining of its general public season tickets. * Honored MSU players update: Arthur Ray Jr. will be honored by the Detroit Tigers on Tuesday at Comerica Park for winning the Discover Courage Award. Ray will be on the field during batting practice and will attend the game. Now let’s see if he can suspend his Chicago White Sox leanings for a night and root for the Tigers. What Denicos has going for him that Jones did NOT have is several other rush threats. Rush, Gholston, Denicos, Bullough, and Norman are guys on the field at the same time that cannot be dismissed. Then you have Darqueze and Adams that might just bang one off the corners. I like Denicos’ chances for matching his number from last year. I can see this getting really nasty for other team. You are exactly right , they can not key on anyone, Jones had little help. * 6 tackles at Nebraska. * 4 tackles & a sweet INT vs. Ohio State. Plus, he was honorable mention All-B1G last season. Not to mention that, as the starting Field CB opposite Johnny Adams, Dennard should get more looks, as opposing OCs will gameplan to keep the passing game away from Adams’s side of the field. I expect that both he & Anthony Rashad White, who also isn’t getting in on the preseason award watch list love, to have monstrous campaigns. Penn State & MSU were the only B1G teams to have two Butkus listees. The Lombardi list is vast due to the thirteen positions eligible for the award; that’s everyone except backs, wide receivers, kickers & punters. Like the Maxwell/Bednarik lists in tandem, I submit that they reflect the broad health of CFB teams–particularly in the trenches. MSU had five of the B1G’s 22 Lombardi listees. Please think about that for a few seconds. Michigan, Penn State, Nebraska, Illinois? Two each. THE OHIO State University? Just three. To put a point on all this watch list stuff, it is all based on at least last years college play and the perceived improvement yet to come, unlike recruiting grades which is based on high school games against Avon Old Farms. Good point this is based on the game played at real speed against similar competition which the star fan boy system is not. I'm really getting tired of this on-going theme from just about every media outlet and blog about "The Rise of the chUMps". If true freshman and players who just finished their junior year in high school, win Big Ten Championships in football, then maybe we are in a little danger. Somehow people have translated the 2012 recruiting class and the un-officially committed 2013 class success in recruiting rankings into big things for on-the-field results for THIS YEAR's Big Ten football team that plays home games in Ann Arbor. I think people over value some of their wins from last year and under recognize the cheesy home-baked schedule on which they fattened up their record. And others just don't think. They get caught up in the idea that "it's Michigan" - as if somehow that wins a game on a Saturday in 2012. If I'm wrong, 2012 will be a horror show - I hate those movies. The visual of those chUMps rising from dead gets me sick. Quick! Get me that empty bucket of popcorn - I might need to puke. Below is a post you might not have bumped into on your own - kinda depends on how into it you are or if you just wait for the next BEATchUMps.com post. This re-post from SB Nation (the parent of The Only Colors Blog) is detailed full of links you might find interesting. Even this guy gets on the never ending train to chUMpsville, but it's still a good read from a well informed author. By the way - the resource center at the bottom of this blog displays real time headlines for every major media source carrying Spartan Sports Articles and Several Spartans Sports Blogs. A daily trip there is like opening the morning paper except it's all Spartans all the time. Related: Michigan State's complete 2012 statistical profile, including projected starters, year-to-year trends and rankings galore. Jul 9, 2012 - In the last two seasons, only six teams have a win total higher than Michigan State's 22: Boise State, LSU, Oklahoma State, Oregon, Stanford and TCU. Ohio State and Michigan are both 18-8, Nebraska is 19-8 and two-time defending Big Ten champion Wisconsin can only match the Spartans at 22-5. State performed at a top 10 level last year, and it returns almost its entire defense and running game. Of course, State also lost a star quarterback, a pair of great defensive tackles and almost every receiver who caught a pass last year. So how much does depth matter over star power? Granted, in players like running back Le'Veon Bell and defensive end William Gholston, State still has some stars, but the quantity has dropped from this time last year. And it is a testament to the job head coach Mark Dantonio has done that, apparently, people aren't automatically writing off the Spartans following the turnover despite the lack of a first-tier name. Make no mistake: Dantonio has done an incredible job. He inherited a fragile team from John L. Smith that had won just 14 games in three years, had won just two of its last 12 one-possession games and had won just two of its last 15 games after Halloween. The last two years: 22 wins, 8-1 in one-possession games, 8-2 after Halloween. He has slowly choked the life out of the Michigan State stereotype and created a healthy, interesting program. He has become the heart of Sparty nation, if you will. While Michigan has focused on catching Ohio State in recent years, Dantonio's Spartans have been busy focusing on, and beating, the Wolverines. They have done it four straight years, and they have finished with as many or more overall wins for four years as well. Still, the maize and blue did improve significantly last year. And Michigan coach Brady Hoke is recruiting incredibly well, even by Michigan's pretty high standards. Dantonio has some work to do to maintain State's recent superiority, and if he has a Rose Bowl bid in him, he might want to get on that. State came within three points in 2011, and they lost a tiebreaker in 2010. They have benefited greatly from Michigan's significant step backwards, but it appears that ship is righting itself. State either needs to win immediately with new starting quarterback Andrew Maxwell, or it needs to raise its recruiting game even more than Dantonio already has. It is not a given that State's window is closing, but the path to a title could be getting a lot bumpier soon. No pressure, Maxwell.Related: Check out Michigan State's statistical profile. One would think that a major conference team that managed to win 11 games despite an overall ranking of 30th (and despite getting obliterated by the best team on its schedule) got some lucky bounces along the way. And to be sure, a 4-0 record in close games suggests the same (after all, the genius fake field goal against Notre Dame was only genius because an Irish defender fell down). But in all, they weren't quite as lucky as you might think. Their YPP margin is balanced out slightly by what was rather poor fumbles luck, and as their Adj. Score suggests above, they really were quite consistent. State succeeded in ways they can duplicate in the future -- punishing run game, play-action, and an aggressive, fundamentally sound defense. But while there is a lot to like about the offense (basically the same things one would have liked last year, minus some line depth), the defense looks as if it is probably a year away from regaining its 2010 form. You can succeed counting on sophomores, but it's difficult to plan on it. It appears as if the Legends division is going to be a complete free-for-all, with Nebraska, State, Michigan and Iowa all having a chance at the crown. State gets Michigan at home but has to head to both Lincoln and Iowa City, and that will probably preclude them from taking the title. But with underclassmen in the backfield and a super-young defense, State should be able to build for making serious noise in 2012. Turns out, I was indeed selling State short. The Spartans were drubbed by Notre Dame in mid-September, but took out Ohio State (in Columbus), Michigan (in East Lansing) and Wisconsin (via Hail Mary) to start 3-0 in conference. They laid a post-Hail Mary egg in Lincoln (Nebraska 24, State 3) and still looked hungover versus Minnesota (State 31, Gophers 24), but they won out and took the inaugural Legends Division title. They narrowly lost to Wisconsin in the conference title game, then narrowly beat Georgia in overtime in the Outback Bowl. In all, the Spartans were mediocre for three weeks, great for four, hungover for two, great for five. They finished 10th in the final F/+ rankings, 11th in the AP poll, 21st in Off. F/+, 13th in Def. F/+ and 19th in Special Teams F/+. In other words, Michigan State was one of the best, most well-rounded schools in the country last year. And two of the three units should be as good in 2012. So the defense should be as good as or better than it was last year, and special teams should still be solid. Michigan State's 2012 fate, then, will be determined by how quickly it can rebuild a passing game. Quarterback Kirk Cousins, one of the best quarterbacks in school history: gone. Receivers B.J. Cunningham (1,299 yards, 10.6 per target, 65 percent catch rate), Keshawn Martin (777 yards, 7.9 per target, 67 percent catch rate), Keith Nichol (359 yards, Hail Mary recipient) and tight end Brian Linthicum (364 yards): gone. And while we're at it, starting guard Joel Foreman (four-year starter, first-team all-conference): also gone. For what it's worth, the running game should be fine. Eight offensive linemen with starting experience return (74 career starts), as do backs Le'Veon Bell (948 yards, 13 touchdowns, plus-16.1 Adj. POE), Larry Caper and Nick Hill. Edwin Baker (665 yards, minus-13.2 Adj. POE) is gone, but he had an awful year in 2011. Michigan State was beautifully balanced in 2011, and the run game will certainly be a key piece. But at some point, they will have to pass, and who knows what happens then? >>>Quarterback Andrew Maxwell was a highly touted recruit in high school. Rivals ranked him the No. 142 overall prospect in the country in the 2009 class. He completed 18 of 26 passes last year (against Youngstown State, Florida Atlantic, Central Michigan and Indiana), and the bar is set awfully high. >>>State returns three wideouts who have seen the field in the green and white: junior Bennie Fowler (14 receptions in 2010 before struggling with injuries in 2011), sophomore Tony Lippett (four catches in 2011) and sophomore Keith Mumphrey (two catches in 2011). It bears mentioning that in their freshman seasons, these three players combined to average a decent 7.8 yards per target.Sophomore receiver DeAnthony Arnett, a Tennessee transfer, was a high-four-star recruit, the No. 84 player in the country (according to Rivals) in the 2011 class. He was the Vols' No. 4 target in 2011 and was granted a waiver to play immediately in East Lansing in 2012. >>>Tight end Dion Sims is also a former four-star recruit and should step into Linthicum's shoes. He was only marginally effective in 2011 (99 yards, 4.5 per target, 55 percent catch rate) but does have a bit of a pedigree. >>>Newcomers beyond Arnett will play a role. Four-star freshman Aaron Burbridge is expected to be eligible after some summer school while redshirt freshman Juwan Caesar and Andre Sims, Jr., each had solid springs. >>>The foundation is in place for a solid passing game. Maxwell, Arnett and Fowler have reasonably high ceilings, and there is depth of options. The issue, of course, is how long it takes for potential to become production. Three teams with potentially solid pass defenses visit East Lansing before October (Boise State, Notre Dame, Ohio State). If the offense can offer only a minor step backwards, the defense could make up the difference. The Spartans' defense was incredibly well-rounded last year -- eighth in Rushing S&P+, 11th against the pass, fifth on standard downs, sixth on passing downs, 13th in Adj. Line Yards, eighth in Adj. Sack Rate -- and returns all of its defensive ends, all of its linebackers and almost all of its secondary. Attrition at tackle might be costly, however. Let's start with the lone question mark. Tackles Jerel Worthy (10.5 tackles for loss, second-round draft pick) and Kevin Pickelman (7.5 tackles for loss) are both gone, as is backup Johnathan Strayhorn. The returning cast of characters is interesting but unproven: enormous senior Anthony Rashad White (4.0 tackles for loss), sixth-year converted end Tyler Hoover (3.5 tackles for loss in 2010), and a pair of interesting redshirt freshmen (Brandon Clemons, Damon Knox). As with the receiving corps, there does seem to be interesting potential here, but it is mostly unproven. If the tackle position isn't a liability, though, there might not be one. Ends William Gholston andMarcus Rush (combined: 28 tackles for loss, nine sacks, seven passes broken up) are fantastic, linebacker Denicos Allen (18.5 tackles for loss) is destructive, the entire three-deep of linebackers returns, corners Johnny Adams and Darqueze Dennard (combined: 5.0 tackles for loss, six interceptions, nine passes broken up) are solid, and some four-star newcomers (defensive back Demetrious Cox, linebacker Jamal Lyles) join the mix. The Michigan State defense has made tremendous strides in recent years under coordinator Pat Narduzzi. It is difficult to even elaborate much on how they were good or what made them good in 2011 -- they were simply strong at just about everything. The Spartans have improved from 63rd in Def. F/+ in 2009, to 42nd in 2010, to 13th in 2011. Recruiting has certainly improved in this time as well (Gholston was a five-star get, while players like strong safety Isaiah Lewis, and starting linebackers Max Bullough and Chris Norman were four-star recruits), and that certainly doesn't hurt. But while tackle is a concern, this should still very much be a Top 20 defense -- a unit that can win games if the offense meets a minimum standard. When you win your division one year and return almost your entire defense and running game the next, you're going to keep the bar pretty high. It seems all but unanimous that Michigan is the division favorite, and the Spartans do travel to Ann Arbor (and Madison), but we'll say that if they don't at least make a run at another title, it was disappointing. We'll set the bar at 6-2 and 9-3. Mark Dantonio has brought a level of stability to East Lansing that had been lacking for quite a while. And if the offense can settle in despite a pretty rough early schedule, then he should have Michigan State in competition for the conference title once again. But Michigan's recent recruiting successes, if paired with a Michigan victory over State this fall (it would be their first since 2007), would provide quite a bit of urgency for the green and white. One of the cruelest aspects of college football is that the best way to become powerful is to have already been powerful once. A rise by Michigan could damage Michigan State's upward trajectory. There's a chance that the window of opportunity could be closing for State, and that makes 2012 very, very important. Arrogance and Scheming in the Big Ten: Michigan State’s Quest for Membership and (chUMps') Powerful Opposition. EAST LANSING — The story as it was known for more than 60 years could be summarized in a sentence: Michigan State finally got into the Big Ten in 1949 after repeated failures and despite the opposition of Michigan. And that was the extent of his explanation. That was the story. Until now. Just when the MSU-Michigan rivalry is producing prodigious flames of passion, here’s some back story to stoke them. Young, who practices internal medicine in Holland, grew up in East Lansing and graduated in 1977 from Notre Dame. A casual conversation with neighbor and then-MSU Vice President Jack Breslin in 1976 about U-M’s opposition and Notre Dame’s assistance first alerted him to the history of MSU’s quest, and 32 years later he decided to unearth its particulars. Ann Arbor, East Lansing and Minneapolis — Minnesota and then-President Lew Morrill had much to do with MSU outdueling Pittsburgh and gaining admission — were Young’s primary research stops. He also visited Ohio State, Northwestern, Wisconsin and made two trips to Iowa, which provided the most resistance to Hannah’s cause outside of Ann Arbor. Young’s “passion turned obsession,” as his wife called it, involved working weeknights until 2 a.m. or later, and weekends from 5:30 a.m. to 11 p.m., with a break for Saturday night Mass. Such is the life of an author in a hurry to finish a book, but not all of them are practicing physicians. Some of Young’s patients would comment on his ragged appearance after long evenings of book work. One of them helped him self-publish the book, and the result is a history not only of the role of athletics in MSU’s growth but of the league it pursued so doggedly. The Intercollegiate Conference of Faculty Representatives, also known as the Western Conference and later as the Big Ten, was formed in 1895 by seven universities. The reason? Largely to get a handle on college football, which was making the transformation from recreational pursuit to lucrative business — complete with paid mercenaries on the field, subsidized by “boosters” and often not even enrolled in school. Among many revelations, “Arrogance and Scheming” smashes the idea that the early 20thcentury was a time of rah-rah innocence for college football. Indeed, scandals and presumed scandals weaved their way through the Western Conference. This was true in Ann Arbor as well. Young uncovered improprieties under the legendary Fielding Yost that were nearly — but not quite — exposed by the Detroit News, buried in boxes at Bentley until now. Shaw Lane Spartans (formerly A Beautiful Day for Football) took a little break this summer. They have always created quality content and finally have a new post - a short one, but unique as always. Return2Glory is in touch with them (they are now following @DUMPthechUMps on Twitter) and as soon as they fix their RSS feed, we will add their post headlines to the Spartan Resource Center at the bottom of the BEATchUMps.com blog page. Here is SLS's latest post. You can comment on their site here. A few weeks ago, MSU received commitments from four players in the last week of June. This is pretty typical of Dantonio recruiting to have a slew of commits right after summer camps. With some luck, we can pass the time of watching the grass grow slowly in the heat and maybe even learn a few things about how recruiting happens at MSU. I dove into Excel headlong with some commitment dates from 2010-2013 and set to work with the charts. 1.) When does MSU land it’s prospects for the year? For as boring as summer is in terms of football, it’s crazy busy for recruiting. If you follow MSU recruiting at all, you probably know this already. What surprised me most though is that in June, July and August MSU receives over 50 percent of it’s commits for the year. (50.8 percent to be precise). 2.) Does MSU recruit during the football season? 3.) So what’s the plan then? Well, it might make more sense like this. The peace sign looking object above points to the following. Roughly 1/3rd of all of MSU’s commits come in the January/February push(Signing Day Push), another 1/3rd come in the June/July (Camp Season), the final third come in the other 8 months of the year. While that might make recruiting tremendously boring mid-season, typically this is offset by the winning of football games. Anyway, not a huge post, but I wanted to highlight how important camp season is to the recruiting cycle at Michigan State and how completely pedestrian in-season recruiting seems to be. Obviously, in-person evaluation in a camp setting is hugely important to Dantonio and staff. Initially, he was recruited as a linebacker, but with the recent massive weight gain and addition of muscle, former Detroit Renaissance star Lawrence Thomas could play defensive end for the Michigan State Spartans. Recruited at around 232 pounds, Thomas, two years later, now has about 290 pounds on his 6-foot-4 frame. The state's top-rated 2011 recruit already had adequate speed, evidenced by his 4.62-second 40-yard dash as a senior. Scouting reports on Thomas suggested that he could play up to five different positions. Terms like "oversized linebacker" were used to describe him. Whether playing interior defense, on the end, or linebacker, Thomas' versatility could prove quite valuable to Michigan State. At defensive end? Rumors have swirled, suggesting that Thomas could be bumped there. But that move isn't certain, says Spartans coach Mark Dantonio. However, Dantonio told Spartan Mag that he's ready to see what Thomas can do -- anywhere on the field. Thomas has been hampered by shoulder surgery and health issues since arriving to East Lansing. "He's a big-boned, big-body guy and very athletic," Dantonio said. "He should be a great player. His problem was health-wise last year. We have to make sure he's healthy, fully-healthy. He has to make it every practice to improve. But he is a good football player," later adding: "He's ready to go. He has great enthusiasm, works extremely hard. He did make it through the entire fall participating last year (after the initial injury in August). From that standpoint, it was a positive. He sort of held off and got the surgery later." Depending on where and how they're used, Thomas and William Gholston could be Michigan State's ideal pair of bookends. With one on the right, the other on the left, the Spartans would have two speedy pass-rushers. Gholston is one of the most aggressive defensive players in the league. Best-case scenario for Thomas would be to mimic Gholston. Thomas and Gholston were involved in a rollover accident in May. Neither were hurt too badly. Adam Biggers has followed NCAA football for over 20 years, specifically the Michigan State Spartans. He can be found on Twitter @AdamBiggers81. We see the term scUM on the Internet - we don't like that. We see vulgar t shirts on campus at the games - we don't like that. We thought the term chUMps had the right balance of fun, family friendliness and rivalry to make it the preferred term for our opponents in chUMpsville. It's no worse than "Little Brother" yet does not carry the arrogance of the label they selected for us. David Brandon might be reluctant to host a night game against Michigan State University, but a contingent of student fans have signed a petition to get the University of Michigan athletic director to change his mind.... Click here if you want to read the article. Seriously now, the Spartans are use to playing in night games because they're always in the dark. Playing football has, is and always will be a pre couch burning ritual for them and their fans. Couch fires for everyone when Michigan wins...Dave Brandon is right on this one. You can't bring in State fans at night time and expect them to behave themselves! Ah, I hate to say it folks, but couch burning is banned and Ann Arbor is cutting their fire dept in half. Kind of scary if you ask me. Since students don't own any property of course they want the game at night. The rest of us adults who live the real world want these hooligans out of town by dusk. If it was left entirely up to Dave Brandon, this game wouldn't be seen on anything but tape delay or cable access. There's no way he wants a fifth straight loss to MSU shown on national television and he'll do everything in his power to take as much attention away from the game as he possibly can. He's hiding behind his desk like a coward and I'd be surprised if he ever publicly acknowledges the petition. A comment that violated AnnArbor.com's conversation guidelines was removed. No. The important games can be played at night but not against these unworthy little brothers. Your comment is short-sighted. Our program only benefits from primetime exposure. Though I hate to say it State has come on to be quite a formidable foe these past four years and I think we would do right as a fan base of Team 133 to stop overlooking this game. This is a win at all costs game this year. What better way to rise than to beat little brother in front of the world? Any time, any place. But primetime? That would be incredible. Hmm...start times are mostly dictated by tv contracts...no way nationwide this holds interest as a prime time game... Sorry to say it but MSU is an in-state draw, not of national interest. I would say that given the msu student's propensity to riot and trash the city,....This wouldn't be a good idea ever. I worry for the safety of Ann Arbor residents and their property. East Lansing has had its fair share of riots... we don't need them burning couches after their loss in Ann Arbor. Noon game. Based on 30+ years of attending games including M vs. ND and M vs. MSU, the conclusion is that Sparty fans approach the Michigan game much differently than do Notre Dame fans. Best to keep the Sparty game in the daytime. Just have city of ann arbor pass a law any green and white clothing being worn within the city limits is a felony. Then we can play the night game without any of the goobers around being arrogant and a pita!!!! I was at the triple OT game and had a couple of real holes if you know what I mean by me sing the sparty song and being a general pain. They fially shut the heck up after the game ended and crawled back into their hole.